The Samsung Galaxy Nexus has a pretty capable 1850mAh battery, but when it comes to productivity and 4G LTE, one would always take a bigger battery and that’s what Samsung is offering now. The Galaxy Nexus now comes with a free 2100mAh extended-life battery and a back cover designed for it, if you purchase it via Samsung Direct. The Galaxy Nexus i515 Battery Bundle Kit comes with a two-year contract activation. This is a six-week promo that kicked off on March 29th and will run through May 10th, or while supplies last. Samsung Direct sells the Galaxy Nexus for $299.99 on a 2-year contract, or the whopping $799.99 without the contract ties. The extended battery is definitely something we would like to see on the Galaxy Nexus, but comparing the $299.99 price on Samsung Direct to the $99.99 price of the same Verizon-bound Galaxy Nexus on Amazon, it looks like you’d be better off looking for deals elsewhere. 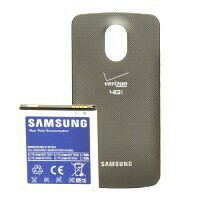 I wish they would give an extended battery to everyone who ever purchased a Samsung Galaxy Nexus. I mean I got one on launch day so I think launch day purchasers should be able to take advantage of this. I think it's only fair! This might be due to the Razr Maxx cutting its sales. To an everyday Joe this looks like just some random phone. The Razr and Maxx look "cool".